The employment report for December 2018 exceeded all expectations with a whopping 312,000 new jobs for the month. This includes franchises, which added 29K jobs to the tally. This is more than 17,500 jobs from November when ADP reported a total of 11,500 jobs. Growth in franchise hiring is an important indicator for local economies because of the job creation and tax revenue this segment provides. The vast majority of franchises are essentially small businesses if they are not owned by headquarters. And individual owners make up the lion’s share of the more than 750,000 franchises currently operating in the US. The International Franchise Association (IFA) says the national economic impact of franchises has been growing in terms of establishments, jobs, payroll, output and GDP with a bright forecast for the future. For franchise owners, this means more hiring, which is what Mark Zandi, chief economist of Moody’s Analytics, said in the press release regarding the overall economy. The December 2018 ADP National Franchise Report said there were 29K new jobs added for the month coming from several industries. 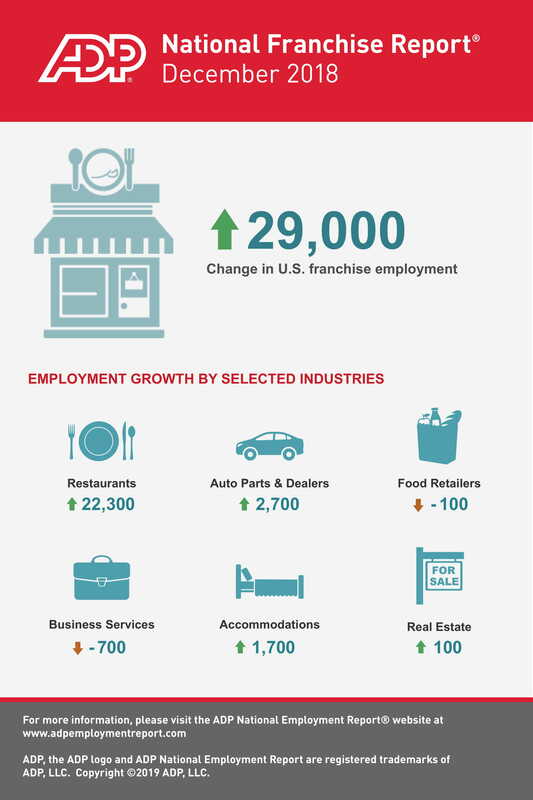 Restaurants added 22,300 jobs, followed by auto parts and dealers at 2,700, accommodations 1,700, and real estate 100. Food retailers were on the negative side this month resulting in -100 jobs, while business services was also in the red with -700 jobs. Both segments were on the plus side in November with 700 and 600 jobs respectively. Accommodations, which was on the negative side the past several months, including -1,500 in November, recovered well in December with 1,700 new jobs. The franchise report provides a detailed view into monthly U.S. private sector franchise market data and trends. It is compiled in collaboration with Moody’s Analytics and published by the ADP Research Institute. The information is derived from ADP payroll data representing 15,000 franchisors and franchisees which employ around 1 million workers in the US. This includes the industries mentioned above as well as personal services, manufacturing, professional services, education, and others.